Now Selling the New Knight House Square Collection Townhome Condos at Embrey Mill! In one of our best-selling communities, Miller & Smith introduces the Knight House Square Collection at Embrey Mill! Our two brand new townhome condo designs are perfect for families who are looking for the space and features of a single-family home, but want the added conveniences of a townhome design. In Stafford, VA’s top family community, we are excited to offer homebuyers even more options in addition to our single-family Hartwood home model. Here are just a few reasons why you don’t want to miss the opportunity to get your hands on one of our new Knight House Square townhomes at Embrey Mill! One of the reasons that Embrey Mill is sought after by so many families, is because the community is perfectly situated in the Northern part of Stafford, Virginia. A quick exit off of I-95, Embrey Mill is close to Fredericksburg, and Quantico, and also not too far from our nation’s capital. The location of Embrey Mill also places its residents right in the Stafford County School District, which happens to be the 17th best in Virginia, and given a grade A by Niche.com. If you are looking for a place to live that truly feels like a community, you can certainly find that and more at Embrey Mill. The feel that you get when you visit the community is unlike any other, where neighbors are always enjoying each other’s company, whether it’s in someone’s backyard or at the community café. Embrey Mill residents also get to enjoy a full calendar of community events held throughout the community such as festivals, 5Ks, and summer music performances! With amenities galore, it’s no surprise that this community is popular for all different types of families. There are multiple parks scattered throughout the community, all with their own unique features like a miniature racetrack or concert stage. The on-site café, pools, playgrounds, miles of hiking trails, and the dog park (a resident favorite) are just the beginning when it comes to amenities at Embrey Mill, and our Knight House Square Collection will be adjacent to the new Embrey Commons with even more to enjoy! Take a look at some information below on our new townhome condo designs at Embrey Mill! Now Selling! Priced From the Low $300s. SPIRIT | 3-4 Bedrooms, 2-3 Baths, 1 Half Bath, 1 Car Garage, Up to 2,300 sq. ft. This home model boasts plenty of spaces for families to enjoy quality time together! The open plan of the main level features a dining room that seamlessly transitions into the kitchen and then the large great room with optional fireplace. Choose to make the lower level rec room an additional bedroom, or add on an optional deck to create an outdoor oasis. VALOR | 3-4 Bedrooms, 2-3 Baths, 1 Half Bath, 2 Car Garage, Up to 2,100 sq. ft.
Anchored by its gourmet kitchen and oversized kitchen island, the star of this townhome model is certainly the main level of the home, perfect for entertaining parties of all sizes. With optional design features to make this the home you’ve been looking for, you won’t want to pass up on this gorgeous end-unit townhome. We are excited to bring another new home design to the amazing Stafford community that is Embrey Mill! We are offering incredible pre-model incentives. Please visit our website for more information. Not only is it important for you and your family to have outdoor spaces to enjoy, but the American Pet Products Association has reported that 44% of all households in the U.S. own a dog. This means that a large percentage of people also need plenty of outdoor space for their furry friends to roam. All of our neighborhoods are close to outdoor spaces, whether it be trails, parks, sidewalks winding throughout the community, or your own backyard. Better yet, many of our communities are located so close to parks that you can walk there from your new home. It’s no secret that when you enter a neighborhood that looks nice, good vibes will ensue. If you haven’t seen facades of our new homes before, you are in for a treat. We have some of the best in the industry. 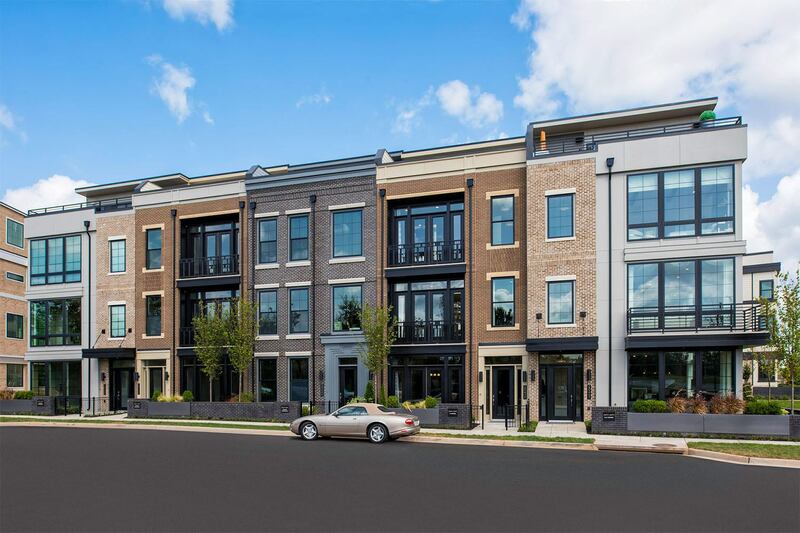 From our modern urban townhomes at Upper West One Loudoun to the more traditional looking Cayden Ridge single-family homes, our designs will blow you away, inside and out. No one likes to hear the rush of rush hour right inside of their own home. This is why Miller & Smith carefully chooses locations far enough away from the hustle and bustle of metropolitan areas, but close enough to the conveniences your family needs on a daily basis. You will find everyday conveniences such as restaurants, stores, healthcare, and schools just a short drive away from any new Miller & Smith home. For many of our homeowners, commuting or travelling for work is just a way of life. It is important to make sure that a new community offers everything you need to make your life easier, including a short drive to major highways, trains, or bus stations. If a daily commute is a part of your routine, our conveniently located communities will ensure you spend less time on the go, and more time relaxing in your new home. Just one visit to any of our communities and everything could change. Learn more about all of our Miller & Smith new home locations in Virginia and Maryland here. Because spring is such a popular season for house hunting, it is the perfect time to remind homebuyers why a new home could be the best option out there! At Miller & Smith, our new homes provide a more comfortable and convenient place for families to live than many pre-owned homes can. There may be some of you who have already begun to look for a place to call home, which is why we want to remind you of the reasons why a new Miller & Smith home should be on your radar this spring season! Feel the spacious and airy designs – New home layouts are designed so that there is plenty of space to be comfortable, move around, and enjoy all of the activities your family loves. The open plan designs found in all Miller & Smith homes encourage quality time with family and friends and create a more convenient lifestyle for you. Think about making it yours – Is it just us, or does the spring season bring about a whole new wave of inspiration? Along with refreshing other aspects of your life in the springtime, purchasing a new home allows you to choose the features finishes, colors, etc. that will make a new home YOURS! Take some of that inspiration you’re feeling and envision a Miller & Smith home as your own when you visit our communities. Get a real feel for the community – Unlike in the winter months, homeowners are now emerging from their abodes and showing off some of the amazing outdoor amenities in each of our communities. When you visit any Miller & Smith community this spring, you’ll see kids running around the park, neighbors cooking out on the grill together, and other homebuyers exploring the neighborhood. Imagine entertaining with ease – Some of the most important aspects of Miller & Smith home designs are the spaces that allow homeowners to easily entertain. In the springtime, it’s even easier to imagine your family hosting a barbeque in the backyard, participating in a neighborhood progressive dinner, or simply entertaining a few friends out on the deck. Visit with a spring in your step – Not only are plants springing into action, but you may be too! It’s not a surprise that spring is a popular season to get things done, because better weather also means happier people. With a spring in your step, get ahead of your new home search and visit our model homes while you are feeling motivated by the new season. For information about all of our new home communities, visit millerandsmith.com!